The Engineer`s Pulse: Why Don’t Airplanes Flap Their Wings? (1) Thrust: the engines on the wings cause a forward force by exhausting air out the back at extremely high velocities. (2) Drag: the air that the plane’s surface must displace poses a resistance, and its force opposes the direction of motion. (3) Weight: the gravitational force pulls the airplane down towards the Earth (the value of this force in Newtons is the mass of the plane in kilograms, multiplied by 9.8 m/s2). (4) Lift: the pressure gradient on the wings of the plane counteracts the weight force – the lift force is dependent on the airplane’s speed, as it is responsible for the pressure gradient. For a plane to maintain altitude, the lift force must be equal to the weight force. 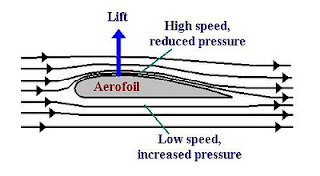 The lift force occurs because of the ingenious design of the cross-section of the airplane wing. When the air is cut by the wing, it meets up on the other side of the wing. However, the air molecules that choose the top path of the wing have a longer distance to cover than do those that choose the bottom path. As a result, the air on the top must travel at a higher velocity than those on a bottom. The lower velocity of the bottom path causes it to have a higher pressure than the air on top. 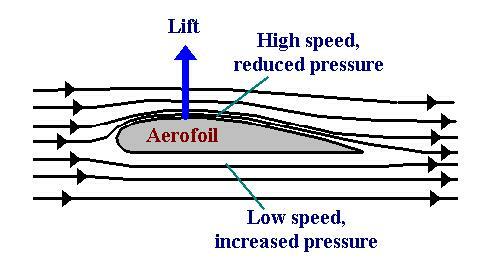 The difference in pressure (pressure gradient) on either side of the wing causes the lift force, which is proportional to the bottom surface area of the entire wing. As the velocity of the plane increases, the air pressure gradient increases. This is why a plane suddenly takes off as it accelerates – it occurs when the lift force exceeds the weight force. The generation of the lift force is depicted in figure 2. It should be noted that early airplane design used an entirely different process to generate lift: tilted wings. Here the lift comes about via Newton's third law: by imparting a downward force on the air (redirecting it due to the angular tilt of the wing), the air in turn imparts an upward force on the wing. The rest of the aircraft motion story occurs in the horizontal direction of the airplane. The thrust pushes forward, but the drag pushes back; drag pushes back harder the faster the airplane travels (roughly proportional to the square of the speed). The plane finds an equilibrium velocity for a given thrust force. The situation is akin to a sky diver that reaches a terminal velocity (constant velocity in the area of 200 km/hr) because the upward drag is equal to the downward weight force. An airplane differs from the diver in that it can control the force that is pushing it along. Aircraft dynamics are actually less simplistic than presented here. For example, the wings can make certain mechanical adjustments to their shape, affecting lift and drag forces. Also, the atmospheric medium that is being flown through is not static. The air is always in search of equilibrium, and fluctuations of this atmospheric environment causes what is known as turbulence for airplanes navigating through it. So, why don’t airplanes flap their wings? To make a long story short, biomechanical structures like birds trump mechanical ones any day of the week. In any case, can you imagine the passenger discomfort if aircraft dynamics resembled bird dynamics? The up and down motion would force even the most seasoned air travelers to resort to the vomit bags. Airplanes do mimic the flight of birds when birds stop flapping and simply glide. However, airplanes are much less aerodynamic, and require constant thrust to maintain velocity. Among other advantages, birds can dramatically modify the shape of their wings at will. As “smart” materials advance, airplane wings will be given this ability as a means of saving fuel. Decades from now, commercial aircrafts will have wings that can bend across their length like falcons. If President Obama really wants American citizens to be more educated, he might insist that the passengers flying in planes learn how they work. A physics manual outlining the basics of aviation would allow the average flyer to appreciate the complexities of airplane design. Passengers might even complain less about turbulence if they realized that it is an act of nature and not an act of God. The physics manual could sit in the back flap of the seats next to the mandatory safety tip illustrations (of impossibly calm passengers sliding out the burning vehicle) and magazines selling only the most ludicrous items (what is it about high altitudes that make a $500 robotic dog toy seem like a good purchase?). I hope that the next time you are in an airplane you will appreciate the lift force that keeps you in the air. Maybe you can educate the passenger sitting next to you. Together, we can begin to appreciate the tools we use as well as the concepts behind them. There was a time when the secrets of aviation were just for the birds. Today, these secrets are common knowledge for aeronautical engineers, who build more and more efficient airplanes every year. A basic understanding of aviation will never be a prerequisite for being a passenger. However, if people would get their heads out of the clouds, they would find that the fundamental principles governing aviation are simple and accessible. Hi there. Nice blog. You have shared useful information. Keep up the good work! This blog is really interesting and gives good details. passenger lift supplier, Goods Lift.